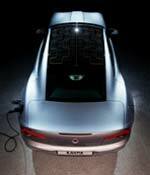 The Fisker Karma 2010 model features a solar roof. Please define the cleantech industry. green buildings and green chemistry. What do you think is the biggest stumbling block for cleantech? Although a slow economy has not helped the cleantech sector, the biggest stumbling block might be inaction in Washington, D.C. The transformation of our energy sector from fossil fuels to renewables will benefit us in ways that should transcend politics. Supporting renewable energy impacts national security and job growth, as well as our environment. How big (in terms of number of companies) is the cleantech market in California now? In the United States? California is estimated to have about 2,200 California cleantech companies, with more being added all the time. The US cleantech market is at least double that (in number of companies). Do you know what sectors most of the California-based startup companies are developing in? For example, in energy generation, emissions control, or water conservation? California companies are leading the way in each of these sectors. California is leading the way in clean technology, period. As goes California, so goes the clean technology industry. Are low fossil fuel prices hurting cleantech competitiveness? If so, how? To a certain extent, yes. The adoption of new technologies ultimately must be market driven. Government grants, tax incentives, loan guarantees, and the like are very important but will only get companies so far. Some types of biofuels, for example, must become more cost competitive with petroleum. The same can be said for electric and hybrid vehicles. We have come a long way from the first Toyota Prius to a vehicle like the Fisker Karma, which comes from a company right here in Orange County. Are green energy tax credits in states such as Tennessee and Georgia making a difference to the cleantech industry? What incentives does the state of California or its cities offer? Do you think they are working? Absolutely, state and local incentives are making a difference in Tennessee, Georgia, and in other states like New York and Connecticut. Here in California, Governor Schwarzenegger has been particularly aggressive in offering incentives. For instance, he has been promoting a plan to exempt cleantech manufacturers from sales tax on equipment they purchase. California's self-generation incentive program could be a big factor in the success of companies like Bloomenergy who are trying to bring fuel cells to the mainstream. We also have recently expanded the feed-in tariff for renewable power generation installations, so that our utilities can buy more energy that customers produce on site. What do cleantech startup companies need to do to get any type of funding at a time when VC funding is down? I think there is plenty of reason for optimism for cleantech entrepreneurs. The venture capitalists we speak to are bullish about the future. A recent Cleantech Group report on 2009 showed almost as many deals as in 2008, which was a record year of cleantech investment. The dollar value in deals for 2009, at $5.64 billion for the year, was an extremely good sign as well. You were a vice president of a cleantech startup company. What was your experience and has it changed? I was fortunate to be a part of Better Energy Systems in Berkeley, a consumer-facing cleantech startup. Better Energy produces the Solio, an advanced portable solar charger. It was and still is the best on the market. Clearly, the economy has changed since I was there in 2007. We focused heavily on the "LOHAS" group of consumers – short for Lifestyles Of Health And Sustainability – who are still very prevalent in the marketplace. SustainLane.com ranked the top five cleantech cities as Austin, San Jose, Berkley, Pasadena and Greater Boston followed by San Francisco, New York, Seattle, San Diego and Houston. Do you agree with this ranking? Yes, I think that is a very good list. In creating CleanTech OC, we are setting out to make Orange County a region that is competitive with any of the "Top 10" cities in terms of innovation, investment, and research. We have closely studied the models of several of the cities on that list. Our work will take time but we are confident it can happen. Do you credit Gov. Schwarzenegger's policies for SustainLane.com placing three of the five cities in California or is it more a local phenomenon? To a certain extent, yes. However, setting the Governor's policies aside, California has a long history of technology innovation and investment, and remains among the thought leadership centers of the world. California has been a leader in Information Technology, or IT, and, to use a phrase from Thomas Friedman, we will lead in Environmental Technology, or ET. In your opinion, if cleantech was properly funded and encouraged to grow, what would the benefits be? Few economic sectors show more promise than cleantech. This is a group of businesses that will revolutionize energy generation, dramatically improve energy efficiency, change the way we build products and buildings, and develop the next great methods of personal and commercial transportation. It is an exciting road ahead.